Since some of the parts I need to continue with the bathroom makeover won't be here for a couple of weeks, I switched gears and started going through my fabric stash. Time to clean it out and either make something or get rid of the fabric. Seems like I am always buying fabric, so I have made myself a promise to use it up or get rid of it. With Fall around the corner, I thought it would be a good time to make a few pillows and the fabrics I have are all good for fall decor. Actually I could use them anytime, but they will be perfect as I transition into fall. 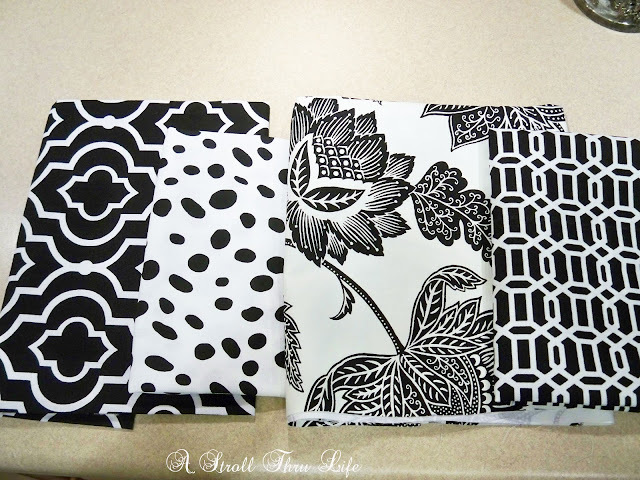 I still love black and white and all of these fabrics are wonderful to mix and match to create a really sharp color scheme. I had enough to make two pillows of each fabric. 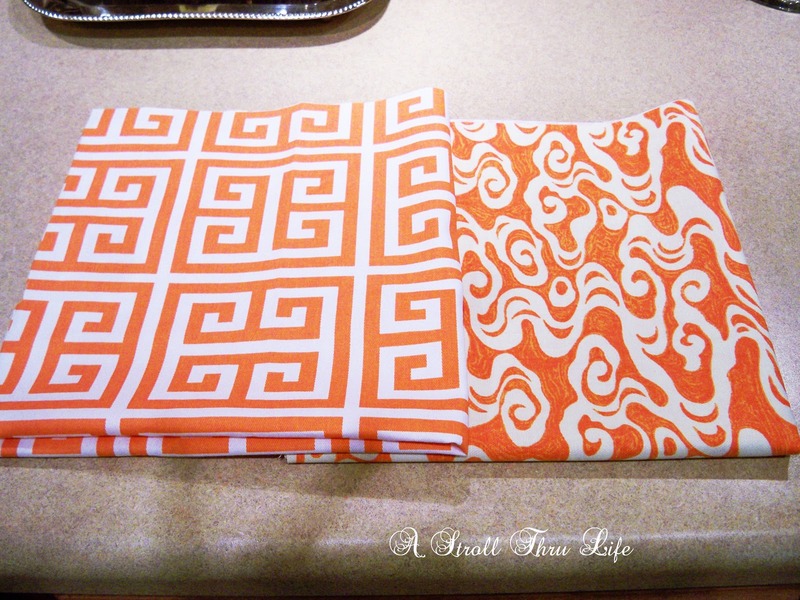 These are pretty orange prints that will be perfect for fall. I had a couple of browns that I had already made one pillow of each, but sometimes pairs are needed, so I will make one more of each of these. Now for the giveaway. I have leftovers that I don't need, so you guys can have them if you want them. I am breaking this up into three groups. 1. Black. These are small pieces - just enough for one pillow each fabric. 2. 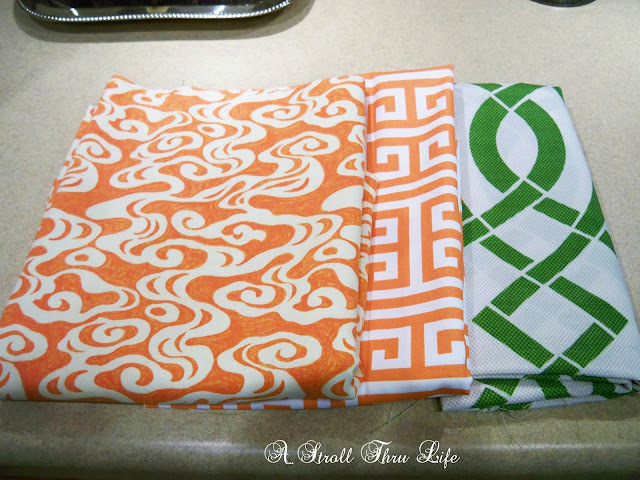 Orange and Green - there is quite a bit of each one of these - at least 1 to 1 1/2 yds. I started making one of the pillow covers of this gorgeous fabric and then decided that it was't me. There is enough for 2 pillows front and back with some leftover. I am also including the pink solid. 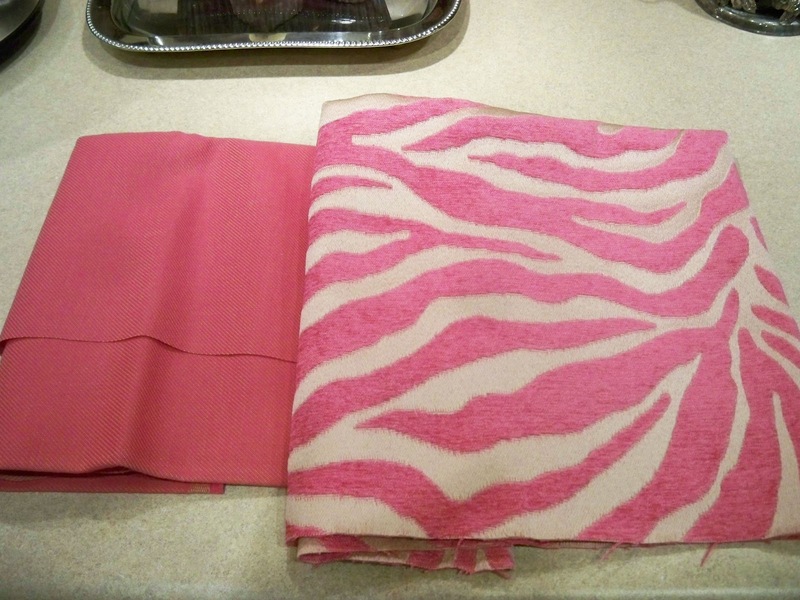 there is also 2 yds of pink and gold zebra velvet and 1 yd of solid pink. If you would like any of these, just let me know in the comments and which group you would like. 1- 2 - 3 Make sure you leave your contact so I can get your address. I will pick 3 numbers - 1 for each group from the comments. Ok, now to get busy and start sewing. Mary, I have been following you religiously for a couple of years now. I love your sense of style. I enjoy watching you change things up and share with us your easy how to, design on a dime ideas. My pick would be for fabric choice number 3. I love, love, love pinks. And peacocks! I would la la LOVE the 1. Black set....such gorgeous prints! I LOVE your blog and always look for new posts! I have posted a few comments, so perhaps my name might be familiar. I LOVE to sew, and we just bought a cottage on a Lake that I have been having so much fun decorating. The black / white combos would go well in the new place!! Thanks for always writing such interesting posts. I live in Canada, but if I am lucky enough to win, I do still have a NH mailing address from when I lived in NH. I didn't specify - so group 1 for me!! I really like the orange and green. So count me as # 2. My email is kathywallace04@gmail.com. Thanks for the giveaway! I love all the pieces....my solarium is white wicker with black and white accents. And I wear white and black everyday....for the last 10 years! And I have orange Mexican pottery mixed in. Therefore, either would work. Very nice of you to do this. I look forward to your ideas. You know how much I love the black and white fabrics!! 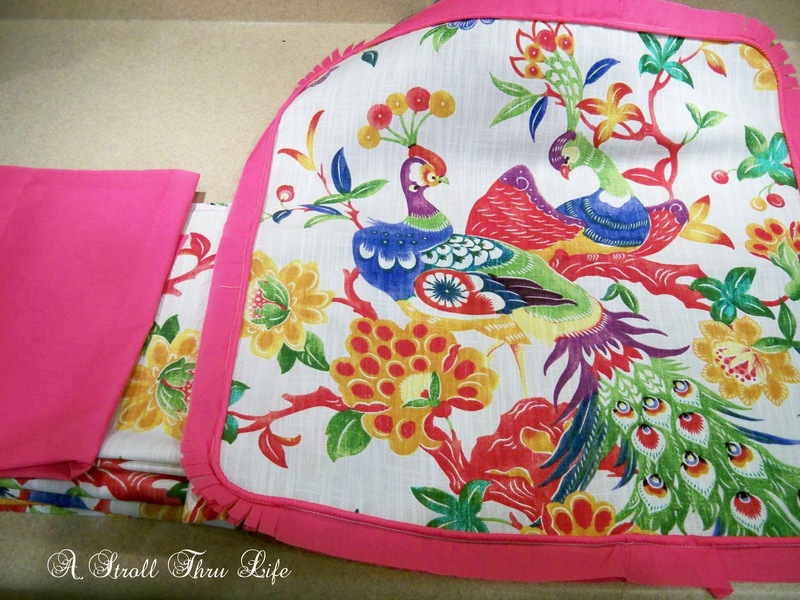 I can imagine them used for a patchwork table runner, too! I pick no. 1 the black fabric. What a nice thing to do. thank you for being so generous! I love No 1!!!! What a great giveaway! I would love to be entered for group #2. It was a hard pick. The fabrics in #1 are really lovely as well. Thank you for such a kind giveaway. My BFF just adores things with peacocks, and she would love to have me make her pillows from your #3 pink fabric! Her eyesight is not good enough for her to sew (or read or drive, for that matter), but something made for her by me from this fabric would be a real treat! All your fabrics are gorgeous, BTW! I get a lot of inspiration from your home and how you have made things to make it special and I am slowly doing the same for my house. The orange and green (group 2) is so beautiful. The all are! I would love the black/white prints! They would go nicely with my daughter's décor! Everyone needs new pillows! I have a small stash of black and white fabrics that Ive been collecting to make a quilt, so Bundle #1 is my first choice. I really like the black and white,number 1. Thank you for being so generous! Thanks for the fun giveaway, and for all the inspiration on your blog! 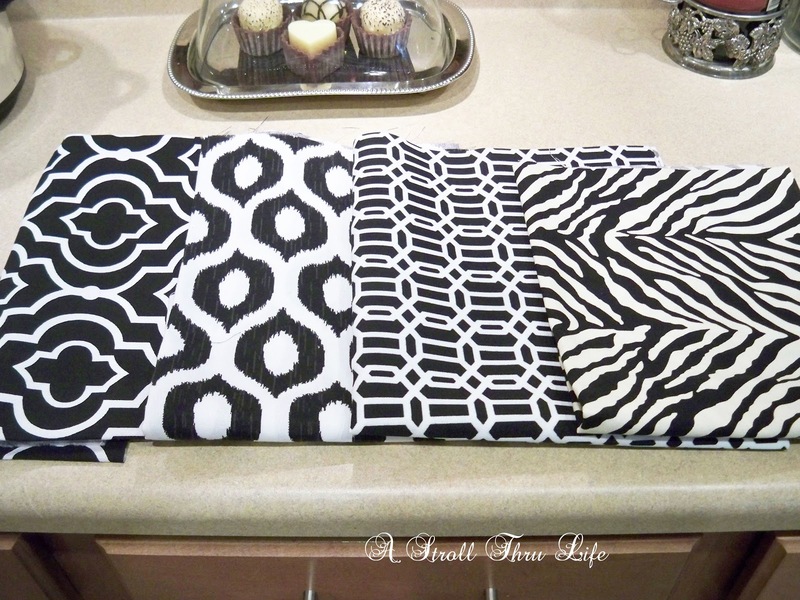 I love the black and white fabrics in group 1. Thank you Marty, what a sweet thing to do..I would to add some black and white to my living room so it's number 1.. I love the orange and green selection. Love these bold prints and thanks for the giveaway. I am loving the black and white, but think the orange is even better. Beggers can't be chooses...but orange for my patio. I like all three groups but black is my favorite. Orange is my favorite color. I'm group 2 for sure. Thanks so much for the generosity! Thanks for sharing your great fabrics with readers! 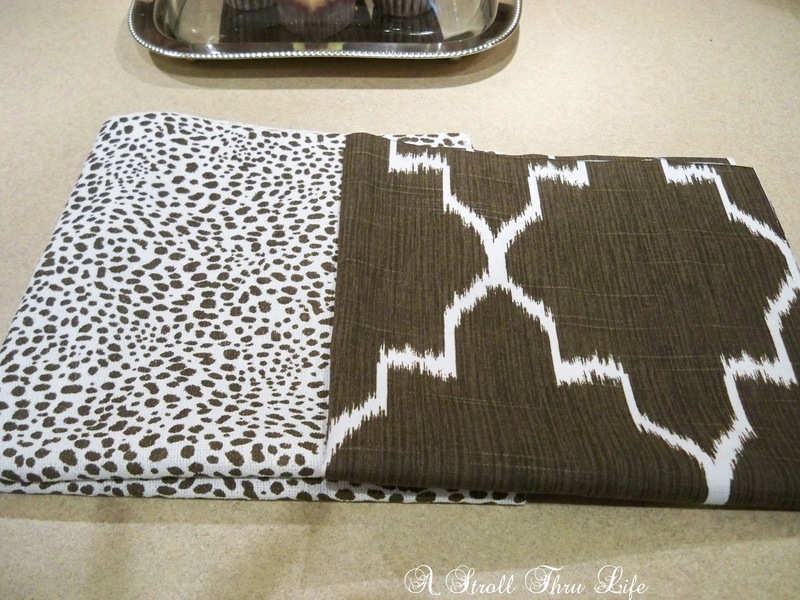 I am working on a room in our home that has mostly gray, and I'm just beginning my search for pillow fabric. I think #1, black, would be very complimentary to the decor. Thanks again! If I can only pick one it would have to be #3. You know I don't sew but my MIL does, would love group#1 or #2!!!!! Thank you for sharing these Marty! How generous of you! I like #1, the black and white.